Gravel filtration is not a new concept although many treat gravel filtration as though it is new to the scene. Gravel filtration is actually a method that has been used for literally thousands of years as a means to clean and purify water. Even the ancient Sumerians utilized this filtration technology. Water was (is) a precious commodity and when times called for it even the use of water that was knowingly contaminated, stagnated, and filthy would be brought to use, and one of the methods to revitalize this water was by means of gravel filtration. Yes, even the ancients knew that percolating water through layers of gravel would strip sediments, break down impurities, remove odors, and purify the water to the point of usability. I’d imagine to get the water into drinking condition they would have even boiled it and perhaps run it over some old coals (carbon)…sound familiar? So why, many millennia later, are many of us arguing about the use of gravel as a means of filtration in today’s constructed ponds? Is it not proven the filtration benefits of gravel? Yes, it is proven many times over! I have pondered this for some time and have come to some realizations as to perhaps why people feel they way they do about gravel as choice of filtration in ponds. In a very general way I think most of the problem lies in the word itself “gravel”. What is gravel? What picture is in your mind when the word gravel is mentioned? What does gravel mean to you? Gravel is highly subjective and usually not defined as to what EXACTLY we mean by gravel. Even now as I talk about gravel some of you envision grit that is used on bird cages, while others picture gravel grains the size of eggs, while others think of the material laid down on highways or country roads. Or the gravel from your living room aquarium, or the white quartz gravel that your neighbor uses around his landscape plants. Are they all gravel? Yes. But I am not talking about any of those types of gravel and most people making arguments for or against gravel as a choice of filtration in ponds never really define what they are arguing for OR against! In my local stone center I have at least 30 or more different types of gravel that I can think of, and only 3 or 4 of those would I consider suitable for use in a pond. I do a lot of troubleshooting on ponds and I have seen everything from sand installed in a pond to gravel that has a 2”-3” grain size (huge!). I’ve seen construction gravel used, and I’ve come across crushed lava rock used to cover the liner and so many other misuses of various types of gravel that I cannot list them all. Probably each one of these pond owners went to a stone yard or home center and asked for “gravel” and the sales person showed them “gravel” and the natural assumption is that this is a material that can be used for pond filtration. So let’s define what is “pond gravel” that can be used for filtration. First, what I use is typically called “river gravel”. The grain size should be anywhere from 3/8” to ¾” if being used for filtration as opposed to aesthetics. And the grain should be rounded/tumbled, not containing an angular appearance or sharp edges (like marble chips or construction gravel). All gravel should be washed before going into the pond, and even a second rinse after install is not a bad idea. A typical gravel filtration bed should be about 2” thick for optimum results. There is the obvious aesthetic value, but how about as a filter. Gravel filtration ushered in a new wave of popularity in aquarium keeping many decades ago and made keeping the home aquarium much easier and prettier. If you are using gravel in your pond you must treat it and consider it as a form of filtration because whether you intend it or not, it is going to function as a filter. The mechanics of any type of filtration is simply removal. Gravel will capture and remove debris, particles, and sediments from the water in your pond and deposit that material in between its grains of gravel where it can now be further broken down by millions of microbes (beneficial bacteria) that grow on the surface of the gravel bed that is filtering your water. So gravel has an almost immediate impact on water clarity, and then it goes to work on water quality. Of course, like any type of filter it needs to be cleaned or it loses its filtering ability. In most ponds cleaning your gravel annually will do a great job of maintaining it in top condition for filtration purposes. Think of this comparison. If a bird dropping falls onto a paved parking lot, it will eventually break down and return to nature; if that same bird dropping falls to the forest floor bed the biological and microbial activity of the forest floor bed will break down that dropping rapidly and efficiently in a fraction of the time that same dropping would take to break down on the paved surface of the parking lot. So, if a fish dropping falls to the floor of a pond with an exposed liner and no gravel, it too will eventually breakdown with some of it returning into the water to reduce clarity. That same fish dropping falls onto the biologically active bed of gravel in a pond that is teeming with microbial activity. The gravel will quickly and efficiently break down that fish waste, and retain all particles from returning to the water. You have increased clarity of water and a much more efficient process of breaking down that nutrient rich fish waste. Now that’s good stuff! I have heard many people complain that they put gravel in their pond and it gets dirty; and I say EXACTLY!! Good!! It is doing its job. If a filter did not get dirty, then it is not filtering right? So, why get upset if your gravel is doing its job. Yes, gravel will get dirty, so maintain it, clean it and let it continue to do its job which it is very effective at. If you neglect your gravel filtration it will stop working. If you really neglect it you will cause your water quality to be dragged down, but don’t blame the gravel filtration, this is the same story with any type of filter, if you don’t maintain it, it will stop filtering and will begin to create poor water quality conditions and it is YOUR responsibility to make sure that all of your methods of filtration are well maintained or don’t complain about it! Gravel filtration technology may be a new and misunderstood concept to those who are getting into pond keeping or who are “anti” gravel in ponds, but it is a very old method of purifying and treating water that might otherwise never be possible to use. The ancients knew this; we moderns should recognize it too. Gravel filtration for ponds is and effective, inexpensive and low maintenance method of filtering a pond. Pond filtration should be approached on many levels for the most effective filtration and having gravel filtration as part of your whole filtration approach can pay off very nicely with minimal effort. I hope this information can help anyone who may have had some confusion as to what is gravel filtration for ponds, and why it is a preferred method of filtration used by many pond keepers and pond professionals throughout the world. Mike thanks for this article. I have struggled to figure out a way to filter my pond. I currently have a basin with the pump inside but in order for it to get enough water in it I have to have the holes big enough which allows leaves to get in. My question about using gravel is, can I just put the pump at the bottom of the pond and bury it with the gravel? If so will it slow the water flow through the pump? Thanks. I’m wanting to make backyard waterfall. The basin below the fall will be roughly 6’x5’x3′. At the lower end I would like to make it about 4′-5′ so I can put the filtration system there. I want to add 4″ of sand before I put the liner down. For the filtration I’m thinking about using the tubing you put in a house for a sump pump with it covered. Then fill around it with lava rock, small gravel (under an 1″) then fill it with pea gravel to make everything level at about 2′. The waterfall I would like to have about 15″-18″ away from the back so it flows into the basin away from the edge. This is the weird part. I’m making it because someone would like to actually sit in the basin and enjoy the water and waterfall. With the fall 15″-18″ away from the edge I don’t think the falling water would hit them directly. I haven’t been able to find anything about someone wanting to sit in the water to find out if this idea would work. I told them that sitting in it would probably mean cleaning more often. Do you have any advice if this would be something that might work? Would the filtration be enough? Any advice even if it’s that it isn’t something that can work is appreciated. Question for you Mike. I’ve used gravel in the past but usually in a bog type setting with pretty slow flow rate. current pond consists of two square chambers and waterfalls upper and highest chamber Im thinking could benefit from me putting a platform about 8″ up from bottom with 2″ of said gravel but my flow rate is higher,so I’m not sure if it will work that great. On top of that Id have to drill holes through concrete for a waste pipe to drain sediment chamber. I.m currently using an ultra violet ultima 2 4000 pump ( which I’m going to up grade to a Gtek 10000.) do you think this will help polish the water better? Thanks for this article! I have a 14,000 gallon cement-lined pond that is 6′ deep with a biofilter that connects to the bottom pump, a skimmer with a pump that connects to a waterfall and Zapp Pure UV. I still don’t have clear water, (although it is not pea soup, thank God) and was considering purchasing a bead filter. I hear these are expensive and time-consuming to clean and they look hideous and a bit intimidating to someone like me who is mechanically-challenged. I covet the crystal-clear ponds I see in the local nurseries and I want one. Bad. The gravel method and maybe a vacuum that has a head that filters the gravel without sucking it up the stones sounds like a dream. Do you think this would help with clarity? I change out the water and vacuum leaves out every spring anyway, so if adding gravel will help, it would save me money and wouldn’t take any more time. Also, I hate barley bales. Tried those too. Yuk. Thanks for the interesting article! I am converting my old concrete shell pool to a natural pool with about 20 sq m of the total 45 sq m as a 13 mm gravel layer varying between 300 and 600 mm deep, and drainage pipes under the gravel drawing out the water and returning it to the pool via a waterfall. Someone has advised that I should incorporate additional 50 mm layers of pine bark and zeolite or perlite into the gravel layer. Is this necessary, or will the gravel alone plus the plants be enough to clean the water? I have a gravel bog pond above the level of my pond planted well so that the plants feed on the “muck” as well as the micro organisms, It then runs down into my pond, seems to be working as a filter is there any do’s and don’ts any one?, should it still be cleaned out annually? Can you tell me the gravel size in millimeter? How do you wash the gravel without pulling out of the lake? please, may you describe the method? Thank you a lot for this useful article, i was seraching just for it! I’m from Italy in Ferrara and I’m building a little pond about 10 mt diameter. After digging, I have spread a geotextile (300gr/m), then the EPDM, then yet another geotextile above EPDM. Now I was really undecided whether to put gravel in the background or not as many advise me of the difficulty in maintenance. I would be for the gravel, I like it! But I read here that the gravel should be pulled out of the pond and washed every year: is it not a tiring task? The geotextile can be a bit ‘impediment in these operations? We are having to fill or close the bottom 20″ of our pond to met the local code requirements RE depth. We have no fish so I am thinking of putting in either a gravel fill with a sump and pump in the sump back to the waterfall or a supported gravel bed to remove 20″ of depth. After reading this, it sounds like filling with gravel, even with a pump to circulate will just end up a maint problem as the gravel will have to be removed. If we have no fish will it still fill with organic matter? If I do a platform with 2″ gravel cover it would be easier to clean but more work to build; but sounds like it is necessary. Hi tim, I do not know that you can modify the fittings on the filter. 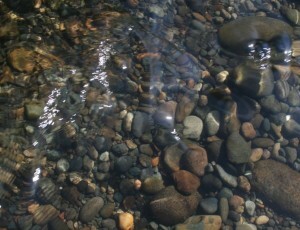 If you are doing gravel filtration in your pond use a 2″ thick base of 3/4″ river gravel. I purchased a sand filter to house my foam and bioballs for mechanical and biological filtration. We are not able to get sufficient output (GPH)with the 2″ inlet/outlet. Do you know of a way to modify a sand filter to allow a 3″ in/out? I have also discussed using the gravel method as discussed above. How much gravel do you suggest if my pond is 1500 gallons? Hello Ed, thanks for reading the blog and telling how youhave gone about filtering your pond. I hope you will check back with the results! Cheers! Thank you for this really interesting read. A while ago I decided I was going to add in a gravel filter bed for my approx. 8,000 litre pond which houses 7 ghost koi, 6 being 12″ and 5 goldfish and 1 mirror carp at 7″. Obviously this pond is not in any way heavily stocked. I am using pressurised/cannister filter at the moment but I am not getting polished water. The chemical balance is perfect and ammonia/ammonium is 0, nitrites are <0.3. pH is slightly high at the moment at 9.0 but I am doing partial water changes to reduce this gradually before adding a pH buffer for balance – but I need to get the new filter running to establish the levels after the new filter starts to work. I have built the filter out of wood and lined it with slabs, followed by sand, then carpet, then more sand, then a tarpaulin then a pond liner. It has a 6" sump with a slight downwards slope and a drain with a stop tap at the far end. It is 4 metres long by 1 metre wide by 1 metre deep. It has 2 feet x 2 feet x 3 feet (LxWxH) pre-filter section which has a sieve for large particles and filter sponge for smaller particles and then has approx 10 feet x 3 feet x 3 feet (LxWxH) of pea gravel (like river gravel I assume). A 6,000 lph pump feeds into the far end through the pre-filter section, and then travels through the 1 tonne of gravel (1,000kg) before being gravity fed back into the pond, 50% through a straight return and 50% via a waterfall. The gravel is planted with water cress to remove nitrates and contend with the algae bloom. Obviously this filter is going to be hugely oversized for the pond size, but this, in my opinion, can only be of benefit! I am hopeful this design will work. It has cost me £90 for the wood, £45 for the gravel, £40 for the liner, £10 for the tarpaulin, £40 for the pipework and £15 for the wire mesh to suspend the gravel above the mesh. The filter has probably taken around 30 hours working time to complete. At a cost of £240, I am hopeful that this filter will be successful and I believe this should be a more viable option for more people as opposed to very expensive commercial filters! You can taylor the filters to your own requirements if you make them yourself! I will let you know whether it works and post some photographs if it is as successful as I hope! Thanks again for a top article! Hey, thanks for the comment. I 100% agree that gravel needs to be cleaned and maintained. I look at gravel as a method of filtration and like any filter it needs to be cleaned and maintained. Just about any filter that is not maintained and managed will become completely ineffective, and possibly start created a toxic environment. I have seen this with canister filtration, bio bead, as well as other methods of filtration. Anaerobic bacteria in gravel beds or filters is a result of poor if not very poor maintenance, and perhaps even some bad pond management practices like overfeeding/overstocking/overplanting (I’m NOT saying this is your particular case). Whichever the case, you’d probably agree that even with the circumstances of poor pond management it can really take quite some time for the gravel to become so clogged with material that it creates anaerobic conditions, and even longer for it to actually start killing off fish; in a properly maintained pond it will not happen at all. I, again, put this issue onto whoever is in charge of the pond. It is not “the gravel” that kills the fish, just like it is not the canister filter that is creating toxic conditions, it is how these filters are being managed. If a pond owner has a clear understanding of how their filtration processes (ALL of them) work in a pond then gravel is by no means a bad choice for filtration and aesthetics. Gravel does not kill fish, it is not the gravel, it is the management of the gravel. thanks for checking out the blog and commenting!!! my $0.02 and experience – I killed two very nice koi before removing my gravel bog. If you do not remove waste in stages before your gravel filters you will create anaerobic bacteria (bad bacteria) which will eventually kill your fish. Even with clean water in and only bio filtration occuring you still have waste accumulating in the rocks from the nitrification process and dying algae which still must be cleaned. Hi Cyndi, thanks for commenting! I don’t know the specifics of your pond, but in general the gravel gets cleaned once annually. My method is to drain down the pond, put livestock in containers, and literally rinse the gravel with a garden hose and sift it back and froth to open it back up again. Then drain out the dirty water. If you give me some of your pond specifics I may be able to give you a better answer! Thanks again Mike. So, now that my gravel has done it’s job in our 4500 gal pond and is really mucky! How do I clean it? My pond is in a 480 gallon container, not a “natural” looking flexible liner in the ground. Would the gravel be beneficial in this setting as well? I am thinking so, but would like your opinion. Thank You! I want to build another back yard pond, we have one that was to deep and large for us to keep up with just a pump and small filter. I want one that is each to keep clean and less cost as possible. My husband is not in total kidney failure and we are paraying for a kidney transplant. We love a pond and I would love for him to have a finished yard to enjoy. Can I use any of an old pool parts like the filter or hoses in the new pond? I have the rocks to go around the pond and could take up the old liner we have. My son did put bleach in it a few years ago when there were no fish anymore, we had moved. My pump is no good anymore. What do you think about a homemade filter. I have to have fund raisers for my husband to get a transplant becasue of only having medicare and no other insurance. for Pat Scruggs and there number is 1-800-642-8399. NTAF is a nonprofit oarganization and all donations are tax-deductible. I guess for now I am dreaming about having another small pond because keeping Pat, my husband is more important. He just does so much for everyone else that I would like somehow to finish the yard and house we are in so it would feel like home to him. Faith is what we live by so if all you can do is pray for he, God will bless you. Please let me know what I would need to get so someday maybe we can have a pond to enjoy. I have never used the gravel in the bottom of a pond. The other one we have was a pre-formed and small. If you can pass this message on about Pat needing a kidney to others who would pray or help, we thank you in advance. I am praying Pat will live, be strong and preach the word of God. He makes poeple laugh and puts a smile on there face. We have to raise the difference that medicare does not pay and on his SS income we can not do that.